Catecholamines are biosynthesized from the common precursor tyrosine, a nonessential amino acid. Tyrosine is synthesized from the essential amino acid phenylalanine but the body's needs are more than adequately supplied by such dietary sources of tyrosine as soy products, chicken, turkey, fish, casein products, and lima beans. Tyrosine is hydroxylated by tyrosine hydroxylase to dopa (dihydroxyphenylalanine) which is decarboxylated to dopamine by aromatic L-amino acid decarboxylase (dopa decarboxylase) (Figure 2). These reactions take place in catecholamine-secreting neurons or cells of the adrenal medulla. 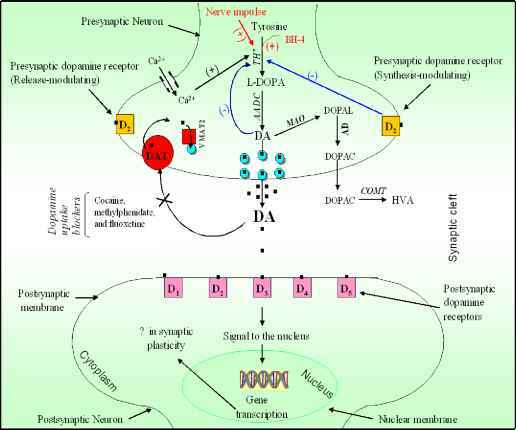 After its movement into granular vesicles, dopamine is converted to norepinephrine, a reaction catalyzed by dopamine P-hydroxylase (DPH). Norepinephrine is N-methylated to epinephrine by phenylethanolamine-N-methyltransferase, a reaction that primarily occurs in adrenal medullary cells. After release from their respective neurons and binding to postsynaptic and presynaptic receptors, norepinephrine and dopamine are primarily removed from these loci and from synapses into their presynaptic neurons by a reuptake process involving transporter proteins. Both catecholamines are also converted to biologically-inactive metabolites by oxidation and methylation reactions catalyzed by monoamine oxidase (MAO) and catechol-O-methyltransferase (COMT), respectively (Figure 2) [1-2]. In vertebrates, tyramine and octopamine are normally minor metabolites present in catecholamine-synthesizing tissues . These "trace amines" constitute <1% of all biogenic amines in mammals. Tyrosine is converted to tyramine, a reaction catalyzed by aromatic Lamino acid decarboxylase and then to octopamine by DPH (Figure 2). The levels of these catecholamines and their biological significance are increased considerably after an MAO inhibitor (such as the antidepressant phenelzine) is taken and then ingesting a tyramine-rich diet (e.g., red wine, aged cheese, pickled herring). Tyramine builds up stimulating the massive release of norepinephrine from nerve endings resulting in a potentially fatal hypertensive crisis . (For decades, pharmacology instructors have used this as a classic example of a drug-food interaction). Octopamine has been shown to play an important role as a neurotransmitter in invertebrates. Figure. 2. Metabolic pathways of catecholamines. Enzymes involved: TH, Tyrosine hydroxylase; DDC, Dopa decarboxylase; DpH, dopamine-p-hydroxylase; PNMT, Phenylethanolamine N-methyl transferase; AADC, L-amino acid decarboxylase; MAO, Monoamine oxidase; COMT, Catechol-O-methyl transferase. L-DOPA, 3,4-dihydroxy-L-phenylalanine; DOPAC, Dihydroxyphenylacetic acid; 3-MT, 3-Methoxytyramine.